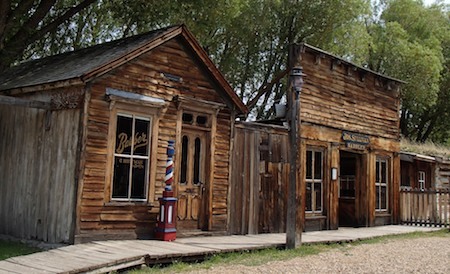 Early August, 2012 – Just a mile and a half from Virginia City, Montana, lies a similar gold rush ghost town: Nevada City. 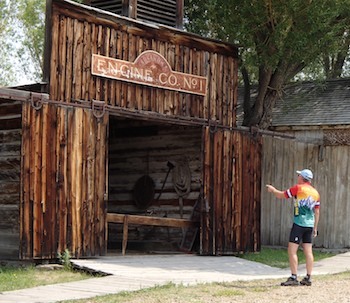 Curious about Montana’s gold mining history, we rode our bikes over to Nevada City to have a look. 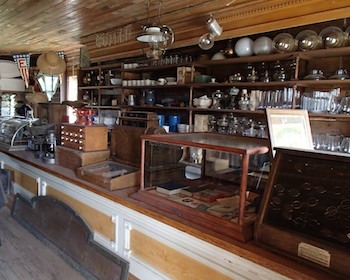 The difference between Virginia City and Nevada City is that Virginia City’s layout and historic buildings are essentially the same as they were in the 1860’s. In contrast, Nevada City got dredged out of existence long ago by massive machines that floated downriver and sifted through the riverbed, panning for gold on a colossal scale. A dredge similar to the ones used in Alder Gulch — the river that offered up Montana gold to the prospectors of the 1860’s — is one of the first things we saw upon arriving in Nevada City. 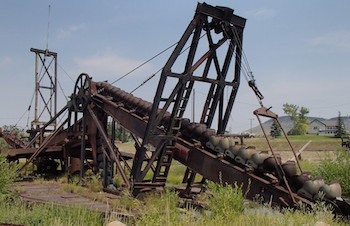 The way these dredges worked is that as they floated downstream, their conveyor of buckets dug up the riverbed and passed it through “trommels” or enormous sieves that sifted out the rocks and the gold. The refuse was dumped behind the dredge, leaving “tailings” that scarred the landscape forever. Looking at the rusting, hulking mass in the grass today, it is hard to imagine the groaning and creaking and effort put out by this machine as it slowly chewed through the riverbed floor, taking out whole towns in its path, while hardworking men oversaw the operation and maintenance of all its mechanical parts. What a voracious beast! 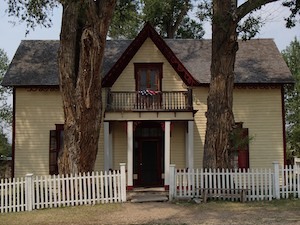 Nearby Virginia City’s existence today is due largely to the preservation efforts of Charles and Sue Bovey who gradually bought the city’s buildings in the 1940’s. This wasn’t a new hobby for them. 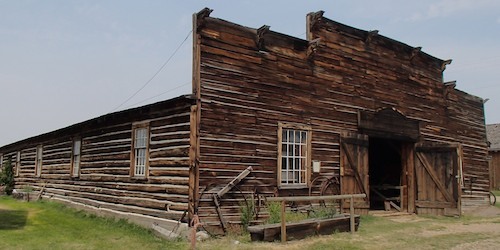 They had begun collecting old buildings in Great Falls, Montana, but were eventually asked to move their collection. Many of their buildings wound up in the “new” Nevada City which they re-assembled to be a recreation of the town that once stood there. We’ve met collectors of Pepsi memorabilia and Pez candies, things that can be housed in a bedroom. But collecting historic buildings was a new one for us! Small buildings in those days…! These homes aren’t very big, however. We paced out the footprints of several houses and found they were often as small as 12′ x 18′ or so, and the doorways were short, even by my standards! Over the years Nevada City has grown to become a repository for old buildings from all over Montana, so it is now a large collection of structures from many eras and in all stages of disintegration. The building I liked most was the little schoolhouse. It was built and used in nearby Twin Bridges and was set up with desks for about 20 tightly packed students (two to a desk). 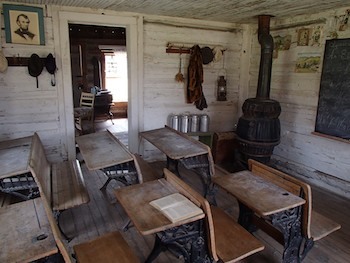 More intriguing than the 15′ x 15′ classroom was the tiny teacher’s apartment out back. It was a single room, about 12′ x 12′, with enough room for a wood stove, a wee table and chair by a single window and a twin bed. The teacher’s apartment is through the back door of the classroom. 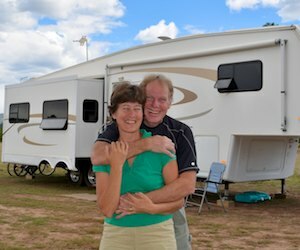 Our fifth wheel trailer has more than twice as much square footage! 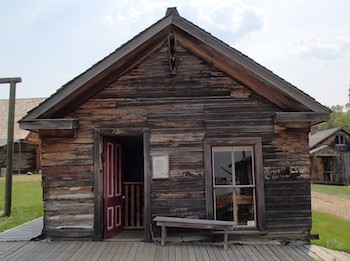 Not to mention hot and cold running water, shower, flush toilet, climate control and modern appliances that those early Montana teachers couldn’t even conceive of. How did they ever make it through those vicious Montana winters in that tiny space? The folks that ventured out west in those days were very hardy souls. 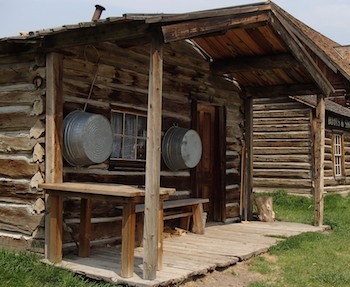 Eking out a living in a tiny cabin in a region that can be buried by snow from as early as September to as late as May seems challenging enough, but many of the miners walked to the Montana gold fields from distant places like Salt Lake City and Denver. In this day and age of pedometers, where we are urged to get off the couch and take at least 10,000 steps a day — yet still rush to grab the parking spot closest to the supermarket door — it is impossible to imagine walking hundreds of miles to apply for a job. A lot of the scenery and stories and buildings of Nevada City and Virginia City made us think of favorite western movies, especially those with Clint Eastwood riding into town on a horse to save the good townspeople from some nasty group of scoundrels. But he always arrived on horseback! He’d slip off the beast with the ease and confidence of a seasoned horseman. No doubt the folks coming to Montana were seasoned horsemen, but owning a horse wasn’t in everyone’s budget. If you wanted to get there to be part of the gold mining action, you walked. Another intriguing building was a cavernous barn-like structure that was loaded to the gills with wagons of every description. 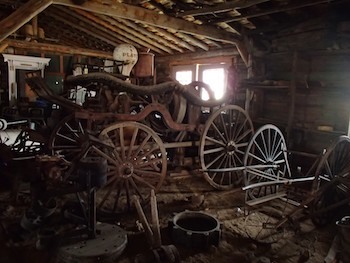 From carriages suitable for Cinderella to horse-drawn “buses” that could carry 30 people, to simple hay wagons, every conceivable rolling contraption that could be towed by a horse is in that barn. It turned out that the building itself was originally the dining hall at Yellowstone National Park. 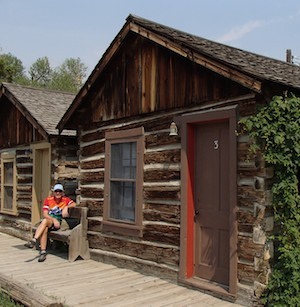 The Park Service replaced all the log buildings at the canyon with more modern structures in 1959, so Charles Bovey disassembled it and brought it to his new Nevada City. Everything you need to build or repair a wagon is in this shop! As we walked through the “town” we could hear the sounds of a player piano and made a bee-line to a building filled with historic automated music making gear of all kinds. One of the player pianos was acting up, and a technician was deep in the bowels of the instrument troubleshooting the problem. We got the sense the museum wasn’t really open, so we left. Unfortunately, I think we missed out on one of the prize displays in Nevada City. Oh well — good reason to go back someday!! 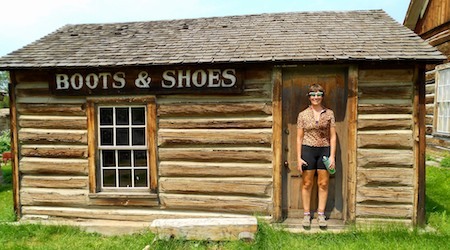 Happily saturated with Montana gold mining history, we made our way from Nevada City to Ennis, Montana, and Earthquake Lake.